The measurement of health literacy is linked to improving client centred care in health services. Different health literacy measurement tools contribute to improving different elements of health literacy. As with all measurements, measuring health literacy has its limitations. Measuring health literacy can create shame and stigma for individuals, vulnerable groups and communities. It is important to have clarity and purpose before choosing a health literacy measurement tool, and to be mindful of any negative impacts which may need to addressed. 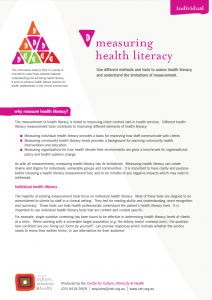 The majority of existing measurement tools focus on individual health literacy. Most of these tests are deigned to be administered to clients by staff in a clinical setting. They test for reading ability and understanding, word recognition and numeracy. These tests can help health professionals understand the patient’s health literacy level. It is important to use individual health literacy tests that are content and context specific. For example, single question screening has been found to be effective in determining health literacy levels of clients at a clinic. When working with a vulnerable target population (e.g. the elderly and/or overseas born), the question how confident are you filling out forms by yourself? can provoke responses which indicate whether the service needs to revise their written forms, or use alternatives for their audience(1). It is known that low health literacy is a common and prevalent issue in Australia. The majority (59%) of Australians are functionally health illiterate(2), but there are no visible signs. Individual testing for health literacy can be stigmatizing and disempowering. Individual health literacy measures can also be unreliable unless fit for a specific purpose, and difficult to administer. A better practice for most health professionals is to adopt the ‘Universal Precautions Approach’. This approach assumes that all patients have a low level of health literacy. Health professionals alter their communication of health information to ensure everyone – regardless of their level of health literacy – achieves comprehension. This way, no one is missed out. Measuring and monitoring health literacy through population surveys provides information for policy makers at a systems level, and health services for planning interventions. It also provides an estimate of the proportion of the population who has low health literacy. It is important that population health surveys are conducted with a specific purpose and context in mind in order to be useful. For example, the European Health Literacy Survey was administered by the European Commission to gain a comparative understanding of health literacy levels throughout eight countries in the EU. It was also used to develop a health literacy index for countries in the region as a measure of health development(3). There are also tools that have been developed to evaluate how well health services cater to clients with low health literacy. These tools measure a person’s ability to access, understand and use the health service. They also measure the organisation’s efforts to make services client centred and can provide a baseline for checking their progress towards achieving health literacy(4). For example, a community health service could use the ‘Enliven Self-Assessment Resource‘ to see if they have the attributes of a health literate health care organisation(5). 1. World Health Communications Associates Ltd, Health Literacy Part 2: Evidence and Case Studies, WHCA, 2010. 2. Australian Bureau of Statistics, Adult Health Literacy Survey, 2006. 3. European Health Literacy Consortium, ‘Comparative Report on Health Literacy in 8 EU member states.’ The European Health Literacy Project, 2012. 4. Smith, K., Nutbeam, D., McCaffrey, K.J., ‘Insights into the concept and measurement of health literacy from a study of shared decision-making in a low literacy population.’ Journal of Health Psychology, 2013. 5. Thomacos, N. and Zazryn, T. ‘Enliven Organisational Health Literacy Self-assessment resource’ Enliven Victoria, 2013.